Print, scan, copy, and fax at amazing speed with the Lexmark X954de multifunction printer. This multifunction colour laser printer is ideal for advertising companies or other offices and business requiring flexible paper handling. The Lexmark X954de A3 colour printer offers banner support and can handle media as large as an A3. This robust unit has a monthly duty cycle of 250,000 pages per month and it has a resolution of 1,200 x 1,200 dpi. The compact X954de MFP printer is quite pricey. The Lexmark X954de colour multifunction printer features a large touchscreen display along with a numeric keypad. There is a flatbed scanner with an automatic document feeder. The standard paper handling capacity is 620 pages, but with optional tray can be expanded to 5,140 sheets. The Lexmark X954de colour laser printer offers Ethernet and USB connectivity and is compatible with Macintosh and Windows operating systems. The all-in-one Lexmark X954de laser printer measures 762 x 640 x 685 mm and weighs 116 kg. Four separate Lexmark X954de toner cartridges are required to fit the black, cyan, magenta and yellow slots in this printer. Users will have no trouble operating the Lexmark X954de workgroup printer, thanks to the intuitive menu on the control panel. This versatile unit delivers good quality and professional output from scans and copies to prints and faxes. Print speed is impressive at 50 ppm for coloured and 55 ppm for black and white. 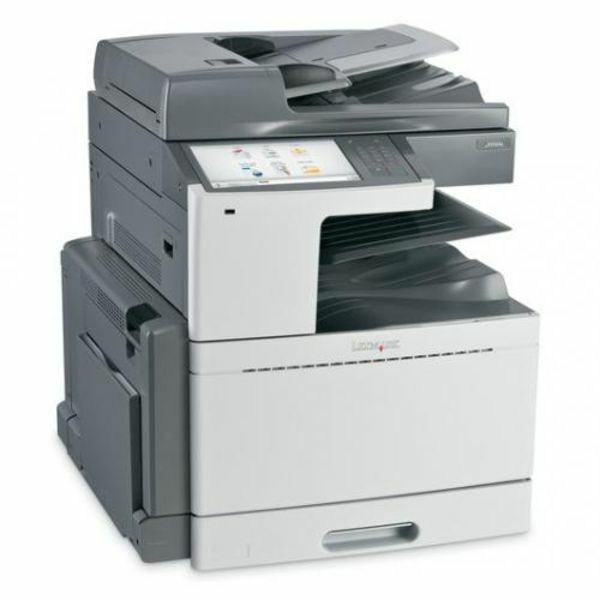 The Lexmark X-954de MFP has exceptional media handling and also offers features like scan to USB drive and scan-to-email. It comes with an automatic duplexer to lessen paper waste. To protect files, the Lexmark X954de is equipped with advanced security. Expect the Lexmark X954de printer to have a high initial cost. Wireless connectivity is optional.